Hello my lovelies! What an amazing time I had over in Nottingham for the #48hoursoffashion weekend; I had heard so much about this up to the big day and I knew for sure that I wanted to go and have a look at the catwalk shows and special events stores were holding, from free consultations to discounts! My mum kindly came along with me, bless her! So we made a girly day out of it all. Even though she isn't overly fond of fashion like myself, she really did enjoy it especially the catwalk shows. As it was the Friday, Events and shows started from 12pm we arrived just after and made our way first to the flying horse walk. Stick & Ribbon were holding a style hunter competition and I thought, why not! 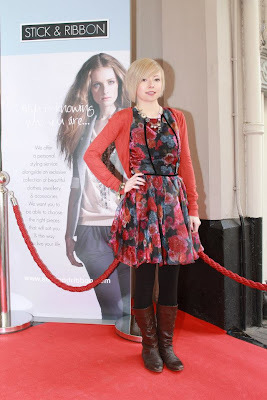 So i was asked to pose standing on their red carpet and had my photo taken which is now over on their Facebook page! They're looking for the most stylish women in Nottingham with prizes to be won, If you'd like to vote for me or you like my outfit I'd appreciate every thumbs up I receive! If you see this picture then thumbs up! Next we had a little visit to Khiel's it was both myself and my mum's first time there and they gladly allowed me to take photos of their fantastic store and displays! Then after we went for some lunch and a glass of wine we went over to where the catwalk shows and master classes we're being held. We attended both the show 4 and 6. Of course I had to get pictures of the stunning fashion that was displayed and the wonderful dancers/models that made it a show to remember! Did you go? And if you did what was your favourite part of the day? Personally I loved the catwalk shows and seeing the new styles and trends! Big thank you for those who worked hard behind the scenes to put this marvellous weekend together! Can't wait for the next one! P.S. If you've voted for me on the Facebook outfit competition let me know in the comments below so I can give you a Twitter shout out!